The region of Helsinki, Finland, consisting of four cities: Helsinki, Espoo, Kauniainen and Vantaa. This map contains over 200 territories and MANY bonuses. Thanks to the size of this map, you can now play it with any number of players you wish, unlike my previous maps, which were quite small. Based on the real maps of the cities. Highly detailed. There are three megabonuses and several superbonuses and, of course, some smaller bonuses. Prepare for huge battles. Pretty decent map. 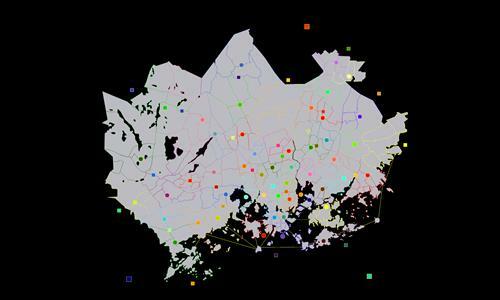 Obviously the territories in and around Helsinki are oddly shaped because of the many lakes and inlets. This makes it especially important that all connections be crystal clear. Unfortunately, they are not. Sometimes territories connect diagonally, but more often they do not. It is frequently unclear how island-containing territories, particularly those in Ullanlinna, connect to one another. Clean these up and the map will be 5-star. Also, there appear to be broken connections between Siltasaari and both Kluuvi and Kruununhaka. The map is now fixed, I guess.